Student Life now proposes improvements to Mitchell field to increase usage flexibility of the fields for various intramural and club sports, increase capacity, and extend the operating hours and operating season for Mitchell. Four softball fields will be repurposed into a large piece of artificial-turf allowing up to 5 soccer/multi-purpose intramural sports fields. The turf will also accommodate a diverse range of fields including rugby, NCAA soccer, lacrosse, intramural football, and ultimate Frisbee. This will be enclosed with fencing to control access, protect turf, and to keep balls contained. Lighting will be installed with shields to keep light on the field with minimal spill-over onto adjacent non-university property or into the night sky. 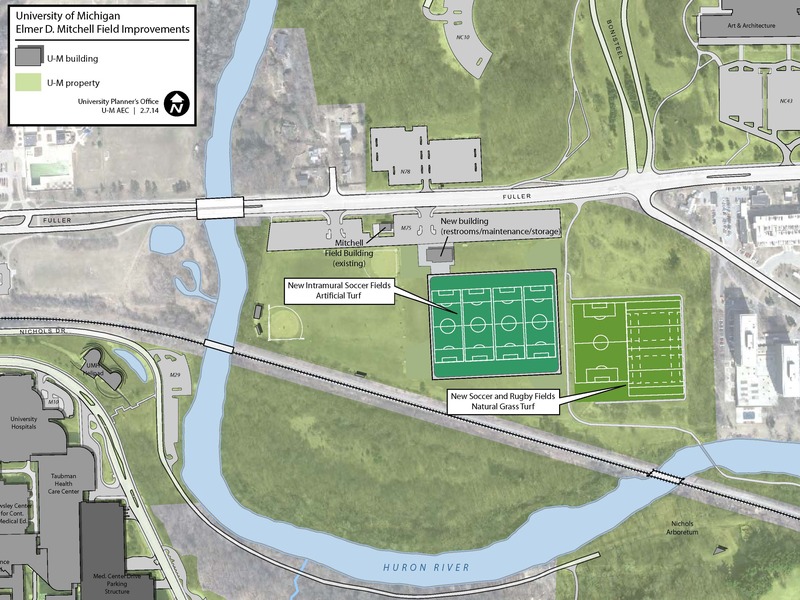 Existing multi-purpose fields will be improved for use for intramural sports team practices as well as games for sports that prefer natural turf (e.g., rugby). The existing lighting for these east fields will be replaced with more energy-efficient fixtures that will also be shielded to prevent light spill-over. The two existing softball fields on the west side of Mitchell Field will remain. Other site work will include drainage improvements, on-site storm water management, and underground utilities. The existing Mitchell Field Building will be renovated for use as storage and a 3,200-square-foot building will be constructed to improve bathroom facilities and to provide for on-site maintenance, storage, and operational support.